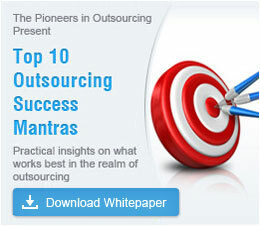 India has made a niche for itself in the outsourcing world. From low end work like data entry to high end research and engineering, almost every level of knowledge work is done in the country. India is renowned for its technical IT talent. It produces more English-speaking IT graduates every year than any other country in the world. Outsourcing is a win-win situation for everyone who is involved in it. America and other Western countries get their technical and back office business requirements and services handled at much lower cost, while the workforce in India can reach global markets and improve its economic status. Due to the lower cost of living in India, American companies are able to save hundreds of millions of dollars. The level of excellence India has attained in the outsourcing field was not achieved overnight: a large pool of educated and versatile Indian workers, government support and innovative training techniques to help workers adapt to (and emulate) different accents have all played a vital role in India's success. Globalization has led to the emergence of a cosmopolitan culture across the world and the decline of regional barriers of trade, investment, language and other cultural factors. Offshore outsourcing is a result of these changes, which have also resulted in a good number of Westerners choosing to work in India—and this number is expected to grow in the future. O2I is located in Bangalore, home to many international companies. When you outsource to O2I, you get your projects completed faster, and are assured of high quality levels driven by Six Sigma principles and standards. Being situated on the other side of the globe from North America, India has the advantage of time zone differences compared to other countries, which benefits many companies. Work sent to India by the end of the day in the US is completed during daytime in India and sent back. Hence the job is done in a day's time and turnaround time is reduced. This difference in time zones has worked wonders for most companies who have outsourced their work to India. Outsource your work to Outsource2india and benefit from the different time zone advantage. The Indian Government is aware of the growth of the outsourcing industry in the country, and is providing all the support it can, such as lower interest rates, fewer foreign exchange restrictions and development of IT enclaves, which have helped the outsourcing industry, along with the encouragement of foreign direct investment into the country. With the Rupee now being fully convertible, Indian businesses are free to invest anywhere. A new and confident India has emerged, though some old problems still persist. At O2I, we look beyond the boundaries of business and are responsible to our customers, employees and the society at large. Outsource to O2I and benefit from our expertise and knowledge pool. Outsourcing has largely become possible due to the improvements in communications between countries. Distance has not a limitation anymore to businesses in the West, allowing them to outsource their jobs to India. Faster and cheaper communications systems have made telephony, e-mail, videoconferencing and data transfer easier and more reliable than ever before. At Outsource2india, we believe in effective and faster communication, exploiting the full potential of today's technology. India has a large pool of educated workers, which is one of the major benefits of outsourcing to India. The availability of large numbers of workers has allowed vendors in India to handle large volumes of outsourced work. At O2I, we hire only the best, and have a talented pool of technical graduates, analysts, sales and marketing executives, graphic designers and skilled creative workers. Outsource to O2I and benefit from our experienced and talented workforce. India has the largest population of English speakers. Due to its colonial legacy, English became a part of the Indian education system, which has now become an advantage. China and Japan have challenged the world with their technological and manufacturing prowess, but could not beat India in terms of outsourcing, as their citizens found it harder to master foreign languages. Indians thus have an edge over other countries due to their fluency in English. With their will to take on the world, Indians are also learning other foreign languages like Spanish, German, French and Japanese at their schools. All of us at Outsource2india have good command over English and we always go that extra mile to understand our customer's needs. Outsource2india offers call center services, data entry services, engineering services, finance and accounting services, creative design, web analytics services, healthcare BPO, photo editing services, software development, research and analysis services and a host of other additional services. Outsource to O2I for professional services at cost-effective prices!